When an employee is terminated from his or her employment, it can either be a “termination with cause” or a “termination without cause”. If an employer has “cause” to terminate an employee’s employment, that employer can terminate the employee without providing any notice or paying the employee anything instead of giving notice. An employee may also be ineligible to collect employment insurance benefits. 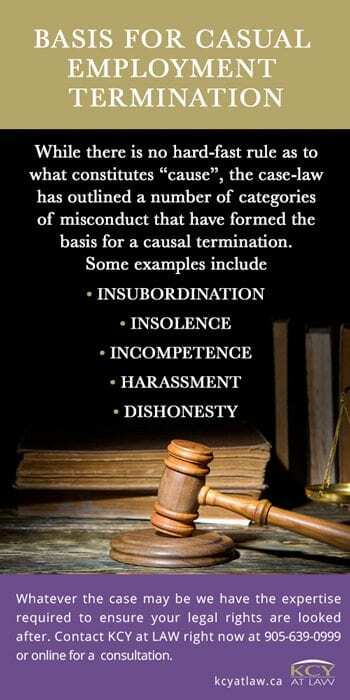 What constitutes “cause” for termination, however, is typically assessed on a case-by-case basis. 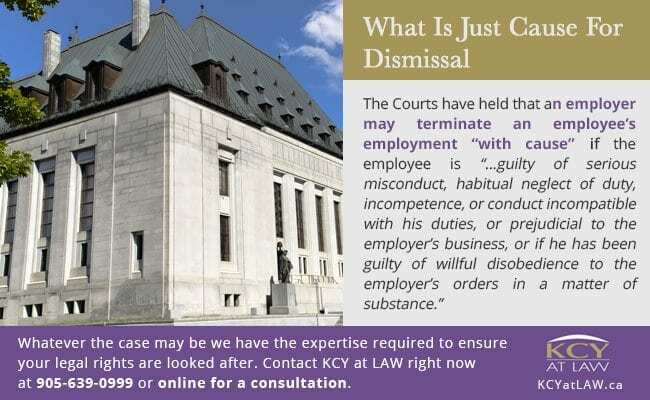 What Is Just Cause For Dismissal? When deciding whether an employer has “cause” to terminate, the Courts look at two primary issues: 1) whether the misconduct may be proven; and 2) whether the nature or degree of the misconduct is sufficient to dismiss the employee without any notice or pay in lieu thereof. Did the employee misconduct result in a breakdown of the employment relationship? What role does the employee have with the employer? How senior is the employee? Did the employer give a warning before they terminated the employee? Did the employer condone the conduct or not raise an issue with the conduct previously? These are all issues that need to be considered when determining whether the employer has “just cause”. If it can be proven that an employer has alleged “just cause” in order to avoid having to pay the employee any form of notice or severance, the Court may order the employer to pay punitive damages for bad faith. Whatever the case may be, we at KCY at LAW have the experience and expertise necessary to effectively assist both employers and employees to ensure your legal rights are properly looked after. 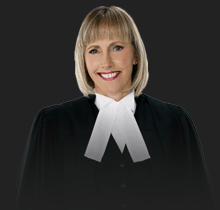 Contact KCY at LAW right now at 905-639-0999 or contact us online and book a consultation!